It's been quite a long while since I have offered an online doll making project. Many of you have emailed asking if I was ever going to go back to the dolls. 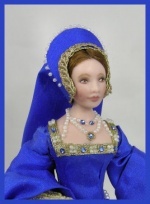 I promised a Tudor era lady doll last year, and it took me this long to finally decide on the final design. I hope you find that she was worth the wait. Our elegant Tudor lady is authentically costumed from head to toe. Her lace trimmed undergarments are made in Dupioni silk. She wears satin brocade slippers. Her beautiful gown is made from Sapphire blue Dupioni silk. The front and hemline edges of the 14" full gathered skirt are trimmed with beautifully embroidered borders of scrolls and candlewicking. The split skirt reveals a gold on creme silk brocade underskirt. The bodice is well fitted, and the sleeves... well the sleeves are as amazing. They feature a very fine batiste under-sleeve gathered tightly to the wrist. Over this is a silk brocade foresleeve, pre-embroidered and split so that the batiste fabric can be drawn thru. Then, very long full, folded back silk sleeves add the third layer. 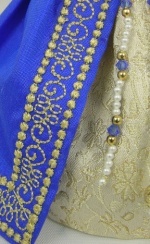 The neckline and waistline are trimmed in tiny pearls and Swarovski sapphire crystals. 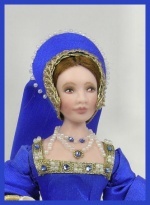 The doll wears an authentic french cap, also trimmed with gold braid, and tiny pearls. This is a very special project, indeed. 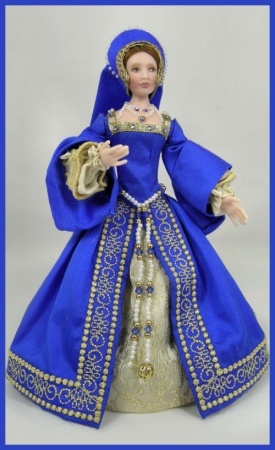 You will receive painted porcelain parts, pre-embroidered silk fabrics for the gown, silks and lace for undergarments, viscose for the wig, beads and crystals, costume pattern, an invisible doll stand and of course an extensive online tutorial. Because of the time required to complete the extensive embroidery and a limited supply of the silk brocade, this class must be limited in size, and is offered on a first come, first served basis. The kit for this project will ship on or before May 15th.